We decided to look into powdered milk. What we discovered may surprise you. We found several websites where you can purchase powdered milk in #10 cans. We decided to buy one can (of their ‘Milk Alternative’) to see if it would suit our palettes. After our first pitcher, we were hooked and here’s why. – This is not the powdered milk of our youth. It tastes great! But here’s a word of warning. After you mix your first batch, don’t take your first taste until after you’ve refrigerated it for a few hours. I’ll admit, it doesn’t taste too great when it’s warm. And make sure you use a whisk to mix, not a spoon. – It has a ten to 15 year shelf life unopened, and a one to two year shelf life if opened. The two of us go through a can about every 6 weeks. – There is no more waste. You can mix as much or as little as you need. For the two of us, I mix 6 cups at a time. I have two pitchers that I rotate, so when one is getting low, I mix another batch so there is always some that is refrigerator cold. No more throwing away a quarter of a gallon because it went bad before you could drink it all. – The nutritional value is comparable to store bought milk. In fact, the powdered milk has a little less fat. Powdered milk definitely plays an important role in food supplies for any prepper family. 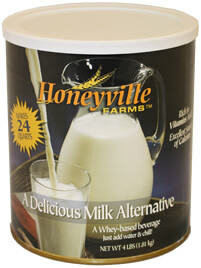 Not only does it give you lots of calories and nutrition, but also a source of calcium. It would be wisdom to research what meadow herbs grow in your region that also produce calcium. Many do, but it would take eating way more salad and greens than folks are used to consuming to get the same amount of calcium. The main issue with doing that is calcium oxalate, which is the culprit in kidney stones. The form of calcium in those meadow herbs will exacerbate issues with people with preexisting conditions. Imagine that under post-collapse conditions. It can be life threatening. Why? When we have a collapse, all of us will be doing lots of extra chores. Those chores translate into bone remodeling. As the human body undergoes work, it responds to the increased workload by routing calcium to the skeleton and using osteoclasts to tear down the scaffolding of the body (the skeleton) that the muscles attach to, and osteoblasts to build up the skeleton in new ways to make it stronger. As a result, if a prepper family doesn’t have calcium sources, then the body will rob Peter to pay Paul. Bones get weak in some places as do teeth, as the body cannibalizes itself in order to do that remodeling. A collapse could seriously harm children’s skeletons without adequate calcium. I would fully expect to see issues with rickets again. Infant formula will be an issue. While breast milk will be the first choice always, there may be problems with this as some mothers have trouble with infections to the breast region. Expect more than normal infections post-collapse with poor sanitation. This means that having powerdered milk might save a lot of folks as well. Companies that make infant formula add oils to their milk to get something that more closely approximates breast milk. Why do I bring this up? Powdered milk stores in a stable fashion because the fat has been removed. Fat adds a significant amount of calories, and when infants are using that as the main source of calories, then every calorie is vital to their survival. Coconut oil is one of the fats that has been traditionally added to infant formula. You might find that adding some coconut oil back in both bosts the nutrition of the milk as well as perhaps saving an infant post-collapse. Note: I was reading and watching a post from the prepper community about a long winter trip. The prepper and his son had carefully stored up supplies and gone over their checklists carefully. However once on the trip, they realized how many calories they needed to survive while on the trip due to all of the additional WORK. They had taken dehydrated food as much as possible since it was more portable. The main problem with any dehydrated food is LACK OF FAT. This is why one can modulate cheaply their prepper supplies by adding in fat that is stable (for a time) into dehydrated foods. This allows the dehhydrated foods to play a role while also making sure there is less hunger and more energy.